John Ireland - "Steve Marak"
Joan Crawford - "Amy Nelson"
Andi Garrett - "Libby Mannering"
Sara Lane - "Kit Austin"
Sharyl Locke - "Tess Mannering"
Leif Erickson - "Dave Mannering"
​​​​​​​Joyce Meadows - "Judith Marak"
​ Following Joan's termination from the film "Hush...Hush, Sweet Charlotte" in August 1964, "I Saw What You Did" was her first appearance in a film. Upon signing her contract for the film on September 29th, 1964, Joan supplied producer William Castle with paperwork from her doctors documenting her complete recovery from her ailment. 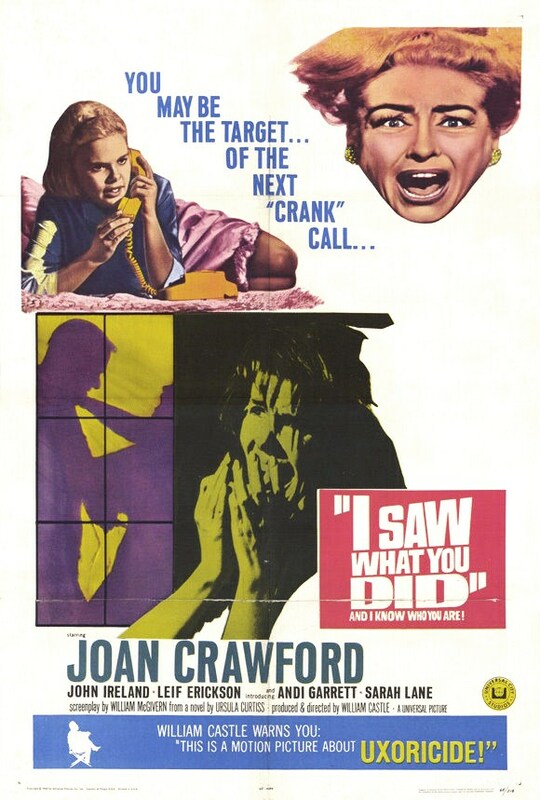 "I Saw What You Did" was the first of a new five-film contract William Castle made with Universal. Pre-production arraignments began in July 1964 upon Castle's completion of "The Night Walker"
​William Castle's original choices for the two elder teenage girls were United Artist actresses Merrie Spaeth ​​and Amy Walker. September 29th: Joan signs her contract for the film. ​​October 27: Principal photography begins on the Universal Studios lot in Universal City, California. May 14th-18th, 1965: Advanced screenings at the State Theater in Minneapolis, Minnesota and the Paramount Theater in St. Paul, Minnesota. June 24th-27th, 1965: Advanced screening in Florida. July 12th - 20th, 1965: Special promotional screenings are held in ​​five cities; St. Louis, Missouri (July 12th), Cleveland, Ohio, Pittsburgh, Pennsylvania and Cincinnati, Ohio. The special screenings are attended by William Castle and Sarah Lane (one of the film's teenaged actresses). July 21st, 1965: Released nationally. August 2nd, 1965: Screening at the Taormina​​ Film Festival in Sicily, Italy. Joan attended this screening. ​$11,165.00 (4-day run, advanced screening, May 14th - 18th, 1965) State Theater, Paramount Theater - Minneapolis-St. Paul, Minnesota. ​​$20,809.00 (3-day run, advanced screening, June 24th-27th, 1965) 4 theaters - Florida​​. $211,000.00 (5-day run, Opening week, July 21st, 1965) 28 theaters - New York (Including New Jersey, Eastern Long Island). $4,000.00 (Fifth week, August ​​11th, 1965) RKO Albee Theater - Brooklyn, New York. $4,500.00 (Week of August 11th, 1965) Art Cinema Theater - Providence, Rhode Island.